Who is the Best Actress of British Tv Series 2018? There are a lot of popular Tv Series in UK Televisions. Some of you liked these series because of outstanding performance of actress in a leading role. We choose the best Actresses of British Tv Series 2018 according to your votes. 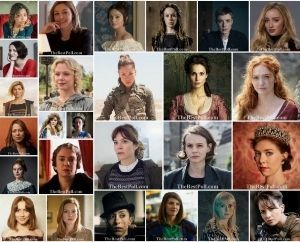 This list is composed of the best actress from British Tv Series 2018. Choose your favourite one and vote! If your favourite actress is not take place in our list, we can add her according to your comments above our post. You can vote only once in 24 hours. Eleanor interpreta a Demelza de una manera natural y totalmente creible. Please add Millie Brady of The Last Kingdom. Please, add Eliza Butterworth. She’s a great actress and deserves some recognition for her outstanding job in The Last Kingdom. Can you add Eliza Butterworth (Lady Aelswith) from The Last Kingdom. She’s an amazing actress and deserves some recognition. Eleanor pulls you into the story. Please add Eva Birthistle from The Last Kingdom to this list! She is so talented!!! Please add Peri Baumeister. She plays Gisela in The Last Kingdom. Peri Baumeister (The Last Kingdom) is added. Thanks for your comment. Please add Jodie Comer as professional assassin in Killing Eve. Jodie Comer (Killing Eve) is added. Thanks for your comment. Claire Foy, the Crown .